A new analysis of the ALMA data for a young star HL Tauri provides yet more firm evidence of baby planets around the star. Researchers uncovered two gaps in the gas disk around HL Tauri. The locations of these gaps in the gas match the locations of gaps in the dust found in the ALMA high resolution image taken in 2014. This discovery supports the idea that planets form in much shorter timescales than previously thought and prompts a reconsideration of alternative planet formation scenarios. More data was needed to determine which theory is correct. We know that the disks around young stars contain gas in addition to the dust. In fact, in general the amount of gas is 100 times larger than that of dust. The research team led by Dr. Hsi-Wei Yen at Academia Sinica Institute of Astronomy and Astrophysics in Taiwan and Professor Shigehisa Takakuwa at Kagoshima University, Japan, focused on the distribution of gas in the disk to better understand the true nature of the disk. If the dust gaps are caused by the variance of the dust properties, that wouldn't directly affect the gas, so no gaps would be seen in the gas distribution. If on the other hand, the gaps in the dust are caused by the gravity of forming planets, the gravity would be expected to created gaps in the gas as well. 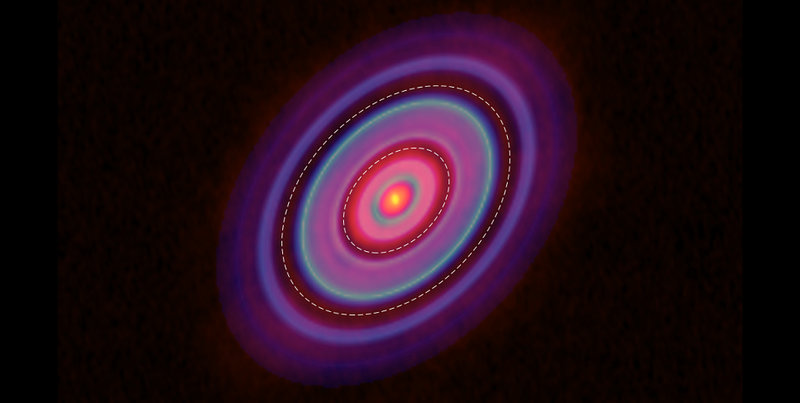 Even with ALMA's unprecedented sensitivity, it was not easy to reveal the distribution of gas in the disk. The team extracted the emissions from HCO+ gas molecules in the publicly available 2014 ALMA Long Baseline Campaign data and summed up the emissions in rings around the star to increase the effective sensitivity. This novel data analysis technique yielded the sharpest image ever of the gas distribution around a young star. The image of HCO+ distribution reveals at least two gaps in the disk, at the radii of 28 and 69 astronomical units. "To our surprise, these gaps in the gas overlap with the dust gaps," said Yen, the lead author of the paper that appeared in the Astrophysical Journal Letters. "This supports the idea that the gaps are the footprints left by baby planets." The fact that the gaps in the dust and the gas match-up implies that the amount of material in the gaps likely decreases. This disfavors some of the theories that tried to explain the gaps solely by changes in the dust particles. A decrease in the amount of material in the gaps supports the planet formation theory, in spite of HL Tauri's young age. "Our results indicate that planets start to form much earlier than what we expected." Yen added. "Our research clearly demonstrates that applying new data analysis techniques to existing data can uncover important facts, further increasing ALMA's already high scientific potential," commented Takakuwa. "Applying the same method to the datasets for other young stars, we expect to construct a systematic model of planet formation." These observation results were published as Yen et al. "Gas Gaps in the Protoplanetary Disk around the Young Protostar HL Tau" in the Astrophysical Journal Letters, issued in April 2016.